Tablets are modern conveniences that make our lives more mobile, productive, efficient, and fun. These magnificent pieces of technology have revolutionized how we entertain and educate ourselves, communicate with each other, and even how we do business. But, since these devices can be used in many different places and in many different ways, we often find ourselves in awkward, compromising, or ergonomically unfavorable conditions. Have you ever spent a prolonged amount of time on your iPad only to realize that you have somehow twisted yourself into a human pretzel trying to get comfortable? Isn’t it counterproductive to do your online browsing/shopping on your tablet if it makes you feel like you just finished playing a contact sport? You might as well be fighting for those sales, literally, throwing elbows and wrestling with other sales-hungry shoppers in a Black Friday stampede. But nobody wants that. So, read on to see how you should be using these tablets - safely -and to make sure that using these devices is beneficial, not a pain in the neck. In January of 2012, Harvard School of Public Health released a study dedicated to the health ramifications directly related to the increasing use of tablet devices such as head, neck, and wrist pain. 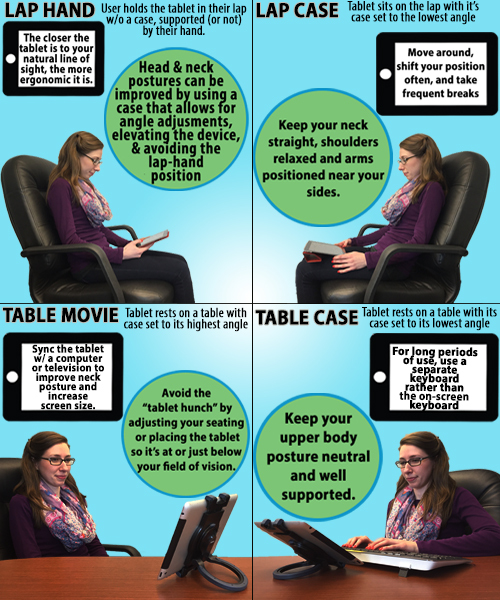 The study, headed by Jack Dennerlein, an adjunct Professor of Ergonomics and Safety at Harvard University, articulates the ways in which a person’s posture as well as the design of the tablet and its case, affect comfort and in turn, the health of users. Dennerlein says that the position in which we hold the device - as well as accessories used in conjunction with it- can impact our comfort greatly. 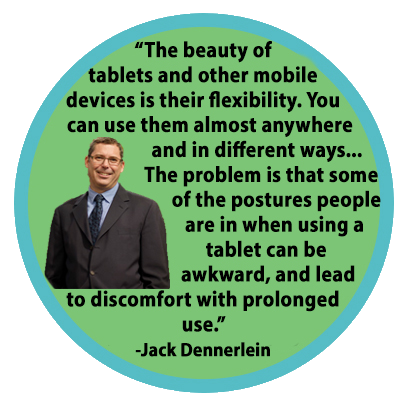 Dennerlein’s study finds that tablet users experience much more profound head and neck flexion angles than traditional computer users and that the worst way to use your tablet is by placing it on your lap. Tablets are meant to make us more mobile and remove the body strain associated with traditional desktop computers and in order for that to work we must be aware of our posture. “With a tablet, you shouldn’t be sitting with [it] for long periods of time,” he says. “They’ve given us the freedom to move around again.” And moving around is Dennerlein’s first piece of advice for avoiding the pain of long term tablet use. A combination of the following tips should help to prevent this avoidable pain in the neck. “You can get away with a tablet propped on crossed legs for maybe a couple minutes on the subway, but any longer- you just don’t want to.” So all those Apple commercials where we see iPad users relaxing on the couch with the device on their lap, surfing their tablet - yeah, don’t do that. While some companies are coming out with amazing mobile devices specifically designed for content creation, most models are engineered for consumption. While there may be a touch screen keyboard on your tablet, that doesn’t mean that using it is a good idea. Besides the fact that it is much more difficult to type on a tablet than a physical keyboard, touch screens are almost always propped at angles that destroy wrists and can lead to carpal tunnel syndrome. Dennerlein suggests that if you are going to be typing a lot on your tablet, get an external keyboard. If scrolling makes your wrist feel like it's on fire, try using a stylus pen to navigate your touch screen. Dennerlein says that the highly reflective glossy display of mobile devices is one of the biggest factors that determine how we position ourselves when using them. As such, we reposition ourselves in order to “fix” our view. Anti-glare screen protectors are available and can reduce your discomfort while you tablet surf. We hope that these tips stick with you, and the next time you find yourself twisted up with your device like a circus contortionist, you'll know to use the appropriate accessories and to self-correct your posture, preventing your tablet from being a pain in your neck.